vidaXL Home Gym Power Tower Workout Station w/ Sit-up Bench Pull Push Chin-up Dip Abs by vidaXL at Strongman Pictures. MPN: 90668. Hurry! Limited time offer. Offer valid only while supplies last. 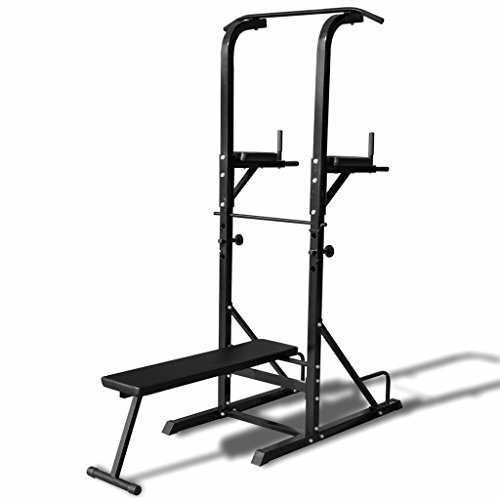 This multi-functional power tower with sit-up bench is designed for a wide range of exercises, such as sit-ups, pull-ups, knee raises and more. This multi-functional power tower with sit-up bench is designed for a wide range of exercises, such as sit-ups, pull-ups, knee raises and more. Capable of supporting up to 220 lb, this multi-functional power tower's sit-up bench and armrests are thickly padded for a more comfortable and easier workout experience. The multi-functional power tower is finished with a black powder coating and a PU cover.